Institute for Neuroscience faculty are uncovering the pathology of autism and schizophrenia. The human brain is a “monstrous, beautiful mess,” author William F. Allman wrote in 1989. More than two decades later, many mysteries of the body’s most complex organ—an intricate web of billions of nerve cells—remain unsolved. But thanks to new technologies and collaborative science, neuroscientists are getting closer to answering fundamental questions about the brain’s functions—and its dysfunctions. That is the aim of George Washington University’s Institute for Neuroscience, an interdisciplinary research base that brings together faculty from the Columbian College of Arts and Sciences (CCAS), the School of Medicine and Health Sciences (SMHS) and colleagues from Children’s National Medical Center. The institute, which launched in July 2010, “acts as a bridge” between CCAS and SMHS, said Director Anthony-Samuel LaMantia, a professor of pharmacology and physiology. And that’s important, Dr. LaMantia explained, because it creates more educational opportunities for students in both schools and also leads to new approaches to scientific problems. In the four years since its founding, the Institute for Neuroscience has seen tremendous growth, Dr. LaMantia said, with 40 affiliated faculty members from CCAS, SMHS and Children’s National Medical Center, bringing in millions of dollars in research funding. The university has hired four new faculty members directly to the institute and several others with neuroscience-related research. 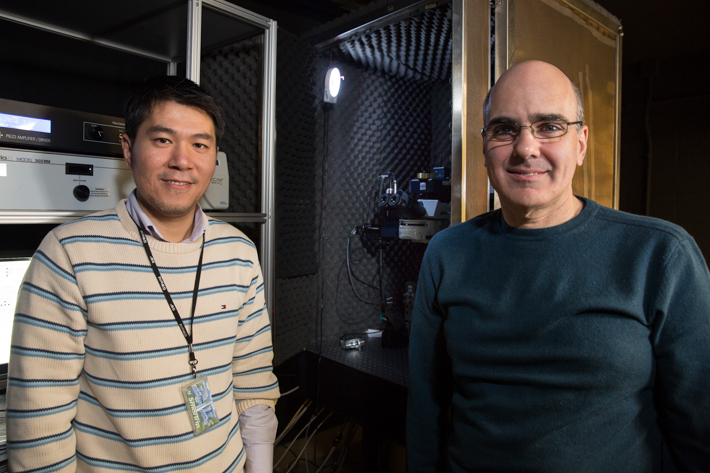 Dr. LaMantia and the institute’s Guangying Wu, an assistant professor in the Columbian College of Arts and Sciences’ Department of Psychology, have received two prestigious awards in 2014 to analyze two puzzling brain disorders: autism and schizophrenia. Both are looking at the brains of transgenic mice—that carry foreign genes—to take a more detailed look at these abnormalities. Guangying Wu, an assistant professor in the Department of Psychology and Anthony-Samuel LaMantia, a professor of pharmacology and physiology, have received two prestigious awards in 2014 to analyze two puzzling brain disorders: autism and schizophrenia. Dr. LaMantia is exploring the link between autism and disrupted brain development with an award from the Simons Foundation Autism Research Initiative (SFARI), a leading funder of autism research in the United States. There is a debate among scientists, according to Dr. LaMantia, about whether patients with autism have too few or too many connections between nerve cells in the cerebral cortex. Dr. LaMantia and his research team, which includes interdisciplinary collaborators from GW and the University of Pennsylvania School of Medicine, will use mouse models to investigate the connections between these nerve cells in order to determine the origins of autism development. By understanding the pathology of autism, scientists may be able to target specific therapies for easing the effects of the disorder. Dr. Wu, a young scientist who came to GW in 2012, received a prestigious NARSAD Young Investigator Grant from the Brain and Behavior Research Foundation in November. With backing from this award, Dr. Wu will study acoustic communication in mice in order to better understand why humans with schizophrenia experience auditory hallucinations and disorganized speech. As a psychology researcher, Dr. Wu said that his previous studies have focused only on the “very basic functions of the brain.” Dr. Wu is now moving his research into more directly clinically-relevant areas, and local resources at GW as well as external support help make that possible. And the interdisciplinary nature of the Neuroscience Institute, has allowed him to take his research to the next level. Dr. Wu has a lab within SMHS, and Dr. LaMantia’s team of doctors provides Dr. Wu with transgenic mice for his study. Faculty, staff and students are “shining a light” on neurodiversity, with a focus on transitions. A conversation with Anthony-Samuel LaMantia, founding director of GW’s new Institute for Neuroscience.